For more information about the amputee program, please call (865) 331-3600. For more information on Patricia Neal’s Amputee Support Group, please contact (865) 331-4912. The Amputee Program is dedicated to providing services to persons who have undergone recent lower or upper extremity amputations. The staff is dedicated to helping the patient regain the greatest level of independence and enjoy the highest quality of life. The program focuses on pain management following amputation, pre-prosthetic limb care, skin and residual limb care, phantom pain/phantom limb sensation, positioning needs, home exercises and coping with limb loss. Patients are given general information regarding the process for prosthetic fitting. Patients are provided with information regarding community resources such as the Amputation Coalition of America, Patricia Neal Innovative Recreation Cooperative (IRC), and Patricia Neal’s Support Group A.S.K. (Amputee Support of Knoxville). 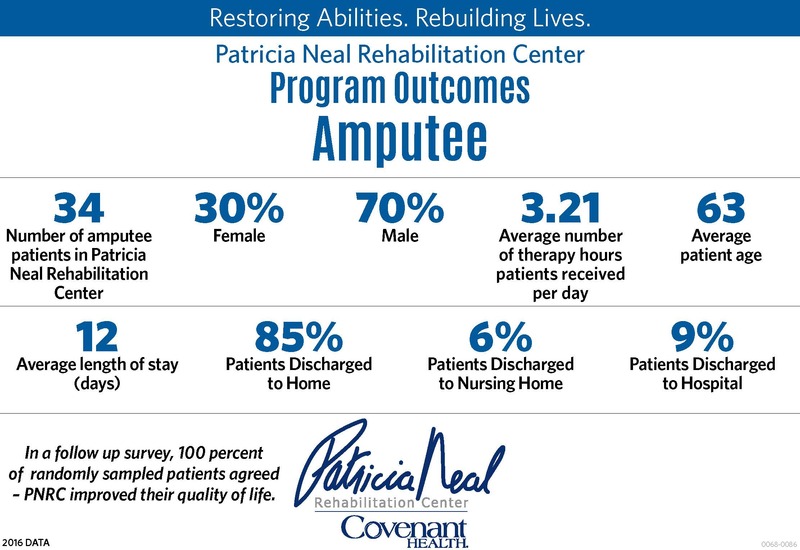 For more information on Patricia Neal’s Amputee Support Group, please contact (865) 331-4912.